Rockville brings you studio quality headphones and at an incredible price with its new PRO-M50 headphones. These are professional grade headphones that are guaranteed to ourperform headphones that cost triple the price! These feature ergonomically designed swiveling cups with interchangeable soft suede or leather finish cushions (included). The ear cups seal tight for excellent sound isolation and minimal bleed. Inside these cups you'll find 40mm Neodymium drivers delivering accurate audio with an extended frequency range for clear and rich bass, and a full frequency range of mids and highs. These are closed back style headphones specifically designed for studio monitoring. These play back the sound with a flat frequency curve so you can hear your music exactly how it was recorded. With the PRO-M50 you can expect to hear every detail of every song with extreme accuracy. These headphones cover full frequency ranges; even extending a bit past the frequencies that the human ear can hear. 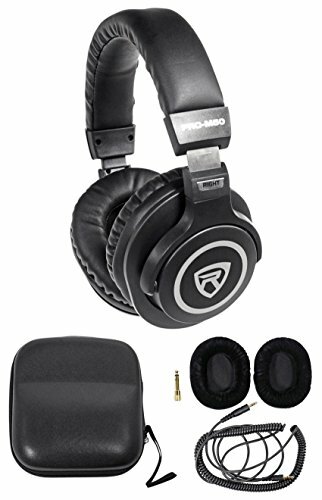 Rockville PRO-M50 Studio Headphones w/ Detachable Coil Cable, Case+Extra Ear Pad . Professional High-Definition Studio Headphones. 40mm Neodymium drivers. Ergonomically designed swivel ear cups. Supreme sound isolation. Accurate sound reproduction. Minimal bleed. Sturdy and durable steel headband and arms. The ear cups seal tight for excellent sound isolation and minimal bleed. Inside these cups you'll find 40mm Neodymium drivers delivering accurate audio with an extended frequency range for clear and rich bass, and a full frequency range of mids and highs. These are closed back style headphones specifically designed for studio monitoring. The headband is made of soft leather, offering ultimate comfort even after extended wear. The beautifully designed stainless steel headband frame and arms are strong and durable. A detachable 51" coiled 100% Oxygen Free Copper cable with a gold plated 3.5mm plug is included along with a gold plated ¼" adapter to ensure the best possible signal. A hard leather case is included to store and protect your new investment when you are on the go.